← WMU-Cooley student from France pitches a strike during Cooley for Kids Day – and in law school. Oxford, England Professor Francis Grimal with WMU-Cooley Foreign Study students, Kirk Seleski, Janelle Wicker, Eula Bacon, and Susan Watts. Western Michigan University Cooley Law School student Eula T. Bacon participated in WMU-Cooley’s Australia and Oxford, England foreign study programs. Her story is posted with permission of the Michigan International Lawyer and appears on page five in the Summer 2015 edition. Perhaps the most significant lesson I relearned from my study abroad experience is not to make assumptions by completing your research before making a decision. During my first year at Western Michigan University Cooley Law School (Cooley), a faculty member suggested I consider Cooley’s Australia Study Abroad Program. I thanked her for the information and continued walking to my 6:00 p.m. class. I attend law school part-time, work full time, and commute to Cooley’s Tampa Bay campus. How could I study abroad? The faculty member knows of my part-time status, so why did she think I should consider studying abroad. Perhaps she knew something I did not. The following year, Cooley launched its Oxford, England Study Abroad Program. Students would live and study at the internationally renown University of Oxford, a university steeping with tradition, located in England, and the origin of American jurisprudence, my new profession. This time I did not let perceived obstacles deter me. I did my research: met with the financial aid and foreign studies staff and discussed a leave of absence from work with my supervisor. Everything came together and on June 28, 2014; I boarded a flight to London, England with great expectations, and two bags each just under the 50-pound weight limit. I arrived on a Sunday and quickly learned that Oxford is a pedestrian town. I walked from the bus station to campus (with my two bags in tow) on the cobblestone sidewalks present throughout Oxford. My first meal was one hundred percent English: fish and chips at a neighborhood pub. I settled into what would be my home for the next five weeks on Hertford (pronounced “Heartford”) College campus, a comfortable room located in a 100-year-old building near Radcliffe Camera. Classes started on Monday. 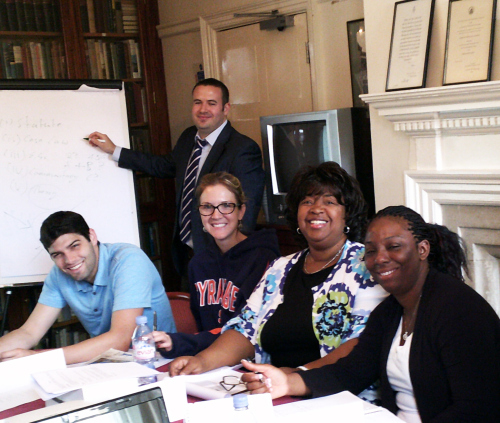 Two courses were taught by Professor Jonathan Black-Branch (Magistrate in Oxfordshire, Oxford graduate, international business owner, author and Barrister). He told the class that studying abroad has a different rhythm from the traditional law school campus. The schedule allows students more time to consider possibilities. He was right. While in Oxford, we discussed my options including operating an international business based in Florida, completing an externship abroad and using my law degree to advocate for human rights. 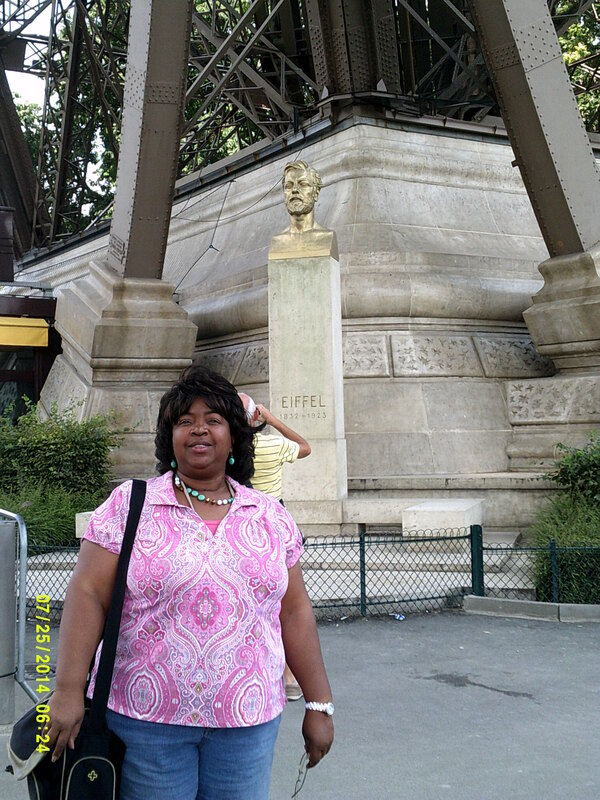 Eula in front of the Eiffel Tower in Paris. My foreign studies schedule was packed: three classes, trips to Bath, London and Paris, high tea, a criminal trial, tours of Middle Temple, Bodleian Library, and Ashmolean Museum, concert at Christ Church, cookout in the park, Catholic mass in Latin (I’m Baptist) and an outdoor matinee performance of the play, As You Like It. The long summer days, with sunrise around 6:00 a.m. and sunsets around 10:00 p.m., gave me time to explore the city. I started each day with an English breakfast of croissants, tomatoes, baked beans, fresh fruit, and of course, hot tea. Learning alongside a German student, attending courses taught by English professors and countless other study abroad experiences, have given me a panoramic view of the world. I am a better law student and a more enlightened individual because of my time in Oxford. I encourage all law students to consider the learning experience of a lifetime. It is within reach; even part-time law school students can study abroad. 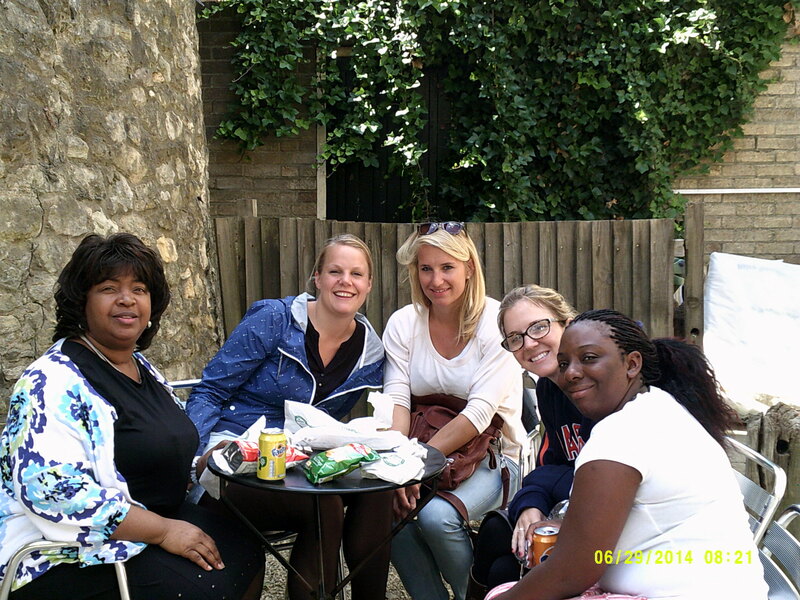 Eula hangs out with her foreign study program classmates. About the Author: Eula T. Bacon is a part-time law school student in her third year at Western Michigan University Cooley Law School – Tampa Bay Campus. She lives and works full time for a non-profit agency in her hometown of Sarasota, Florida. Ms. Bacon is an active member in the Tampa Bay Inn of Court, Vice Chief Justice of the Moot Court Board, and Associate Editor for the Journal of Practical and Clinical Law. Her community service activities included helping with community legal redress workshops and the Walk to End Lupus Now.